Broken plates, old tiles in a skip and shattered windows are all opportunities to Highton artist Helen Millar. For more than 20 years the mosaic specialist has found new life for broken glass, China and ceramics from friends, family members and op shops. “They’ll say, ‘Oh, I broke a beautiful plate, can you re-use it?’,” she told the Indy. A former art teacher, Helen set up a home studio in Highton about two decades ago after having children of her own. Helen sometimes smashes old plates and glass, but more often she uses nippers to methodically chip away materials. About 15 years ago she received a community grant to teach other people the “user-friendly and accessible” art. “Anyone can do it,” she said. Her three pet chickens had inspired her students’ regular favourite piece, “a bird on a stick”, she said. 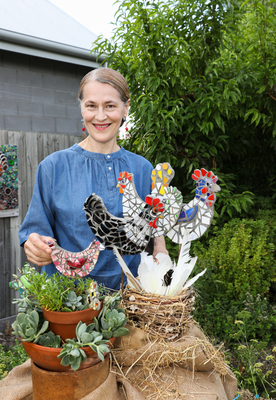 Helen’s sculptures decorate Geelong West Community Gardens and she will hold her next public workshop there tomorrow, from 1pm to 5pm. “It’s such a beautiful place to work,” she said.